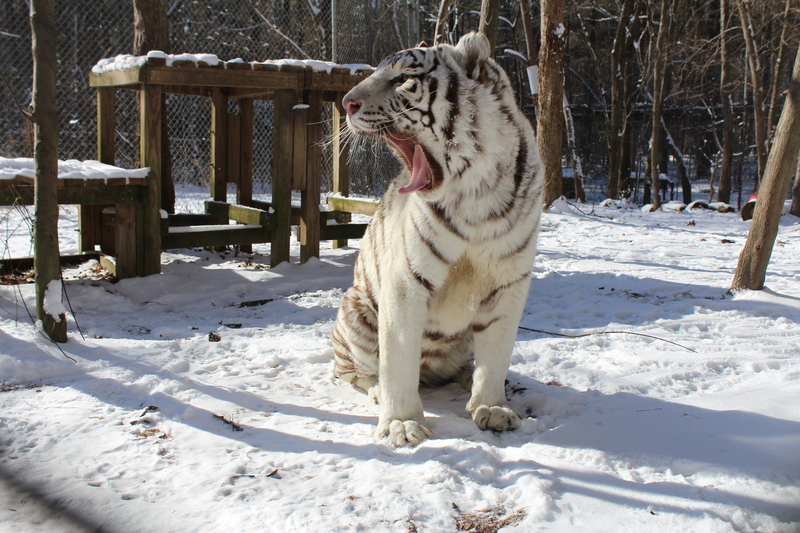 Saber is a great example of how beautiful white tigers can be but also how detrimental the inbreeding that produces them can be, as it causes harmful birth defects in the tigers. Due to inbreeding, Saber is cross-eyed, which limits his sight. 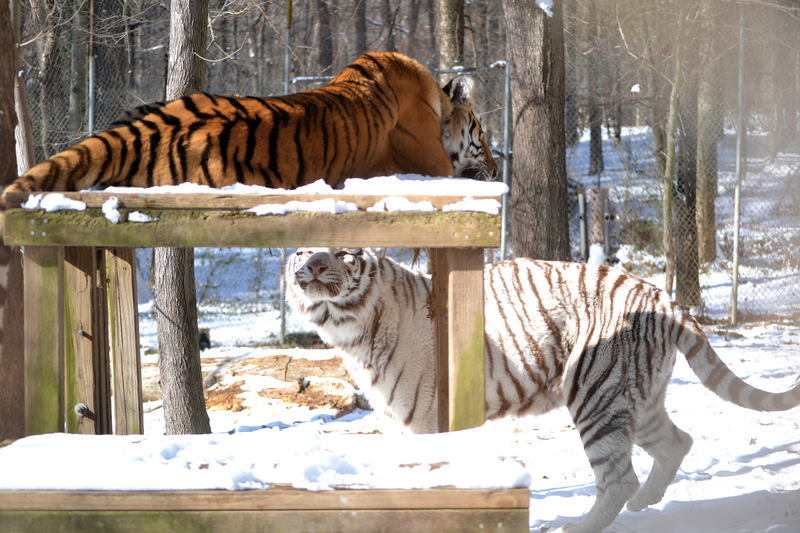 Saber seems to always be happy; he enjoys getting enrichment and lounging with Shenandoah, his enclosure-mate. 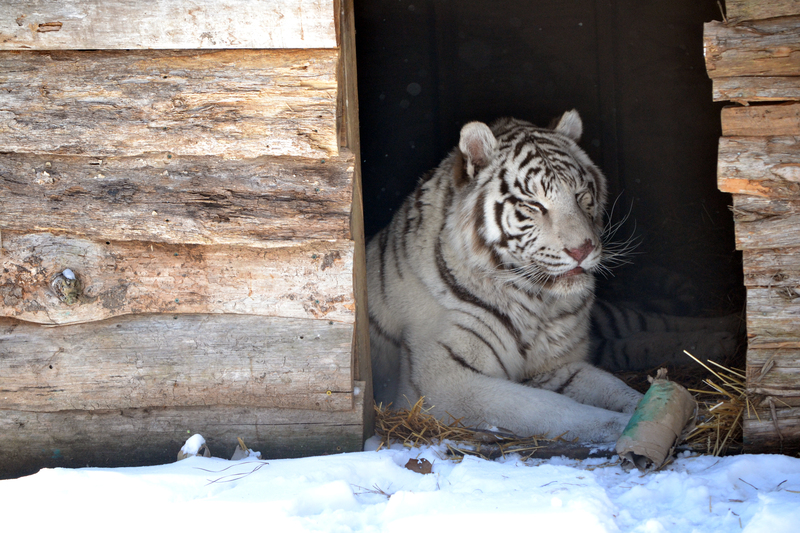 Saber especially loves water! 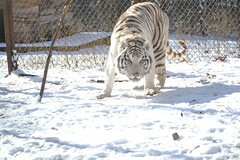 He is always playing in his water dish! 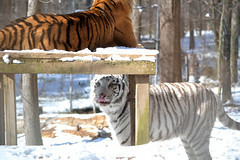 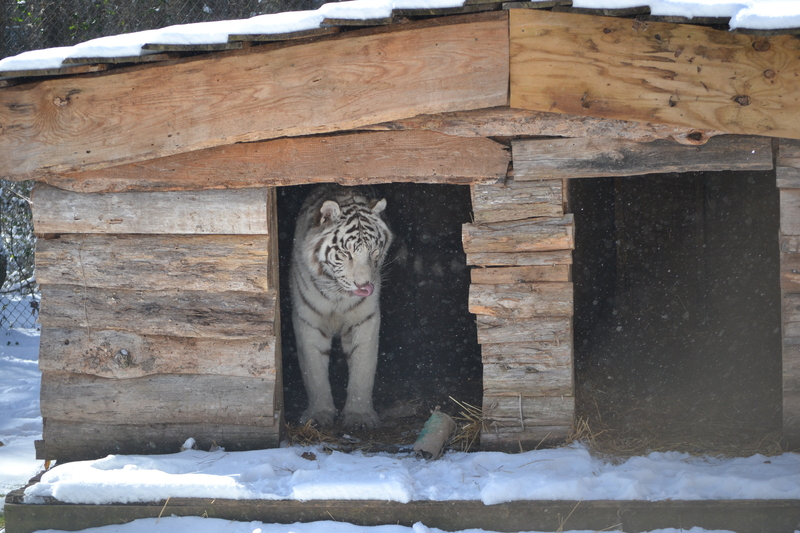 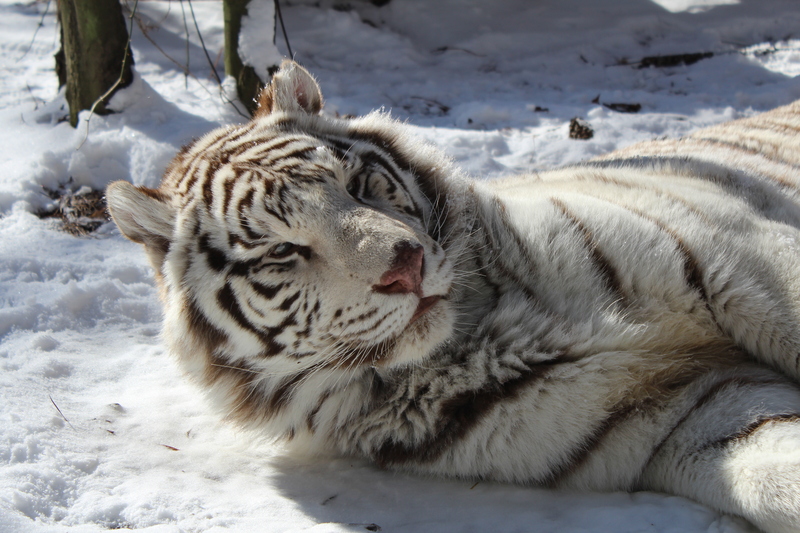 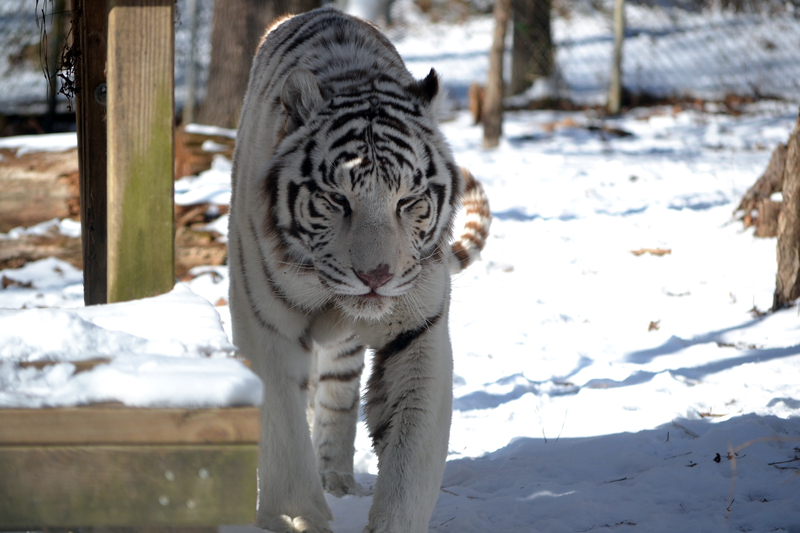 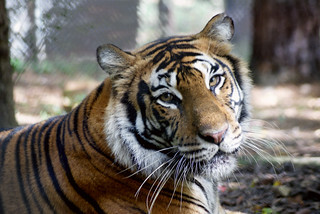 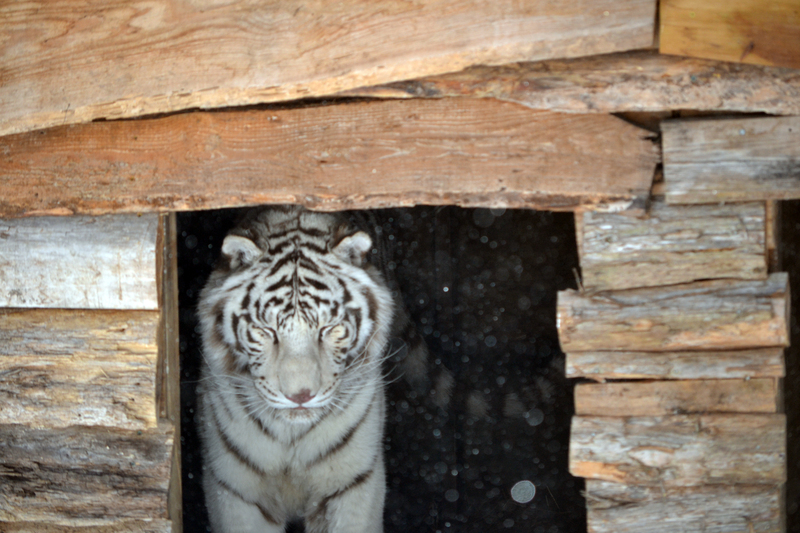 Saber came to Carolina Tiger Rescue with his enclosure-mate, Shenandoah, and fourteen other animals from a facility out in Colorado. 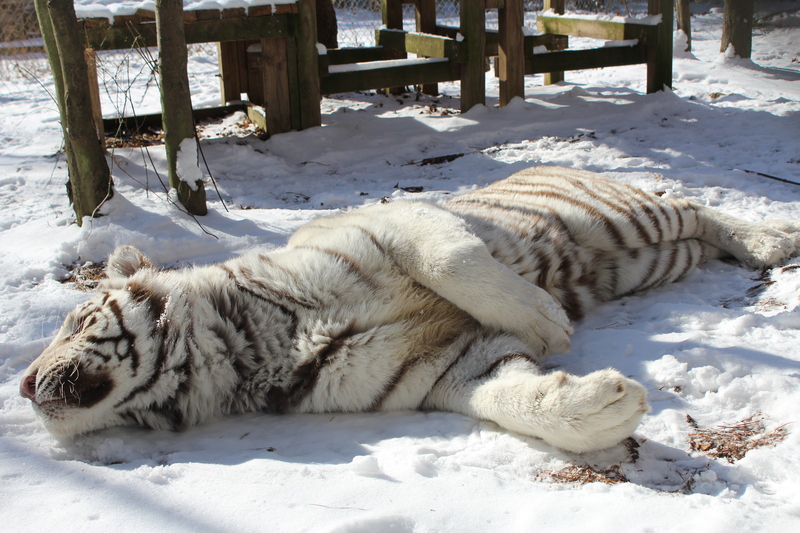 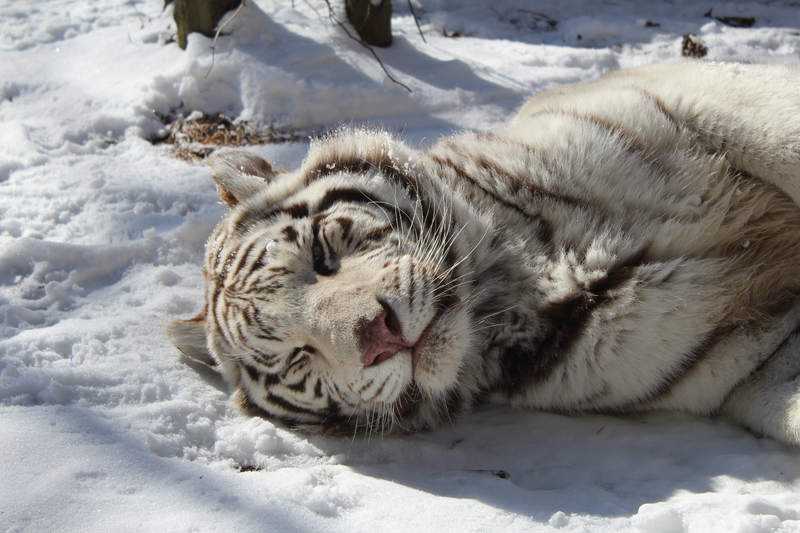 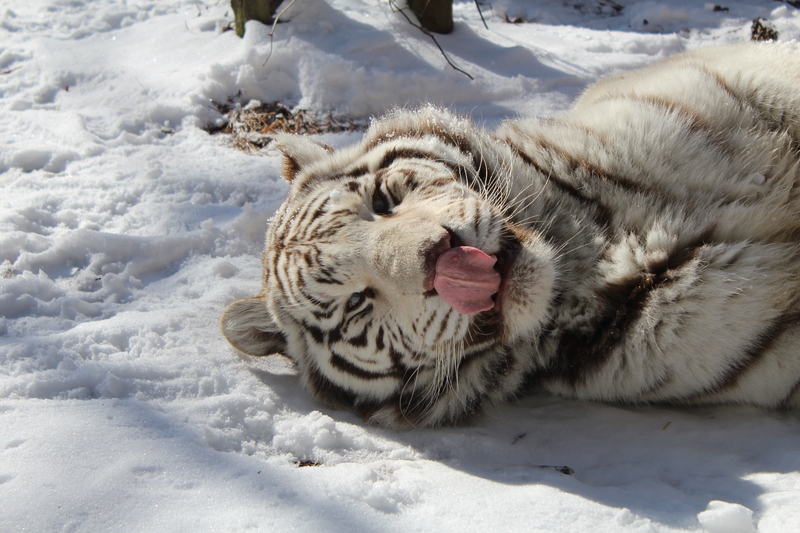 This facility closed down when the owner fell ill. Carolina Tiger Rescue worked with several other sanctuaries around the country to find homes for over 100 animals in just over three months. 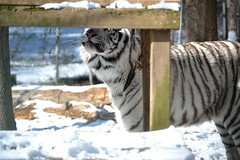 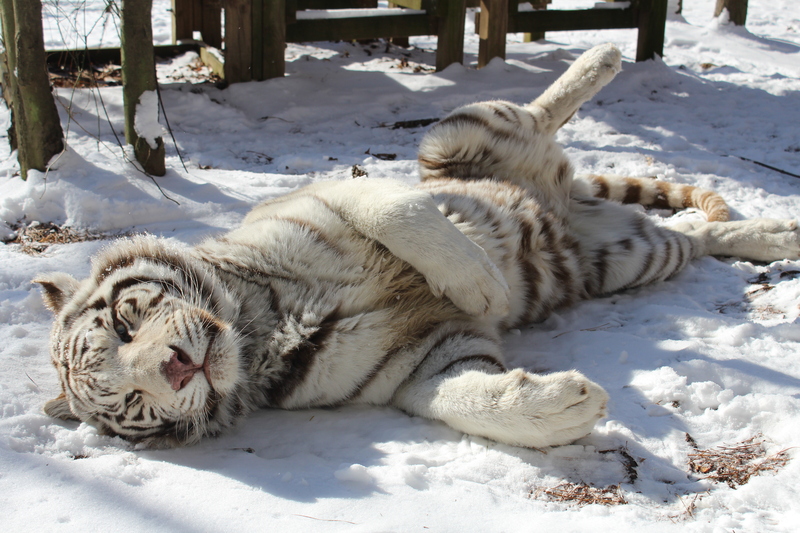 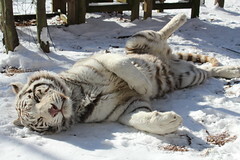 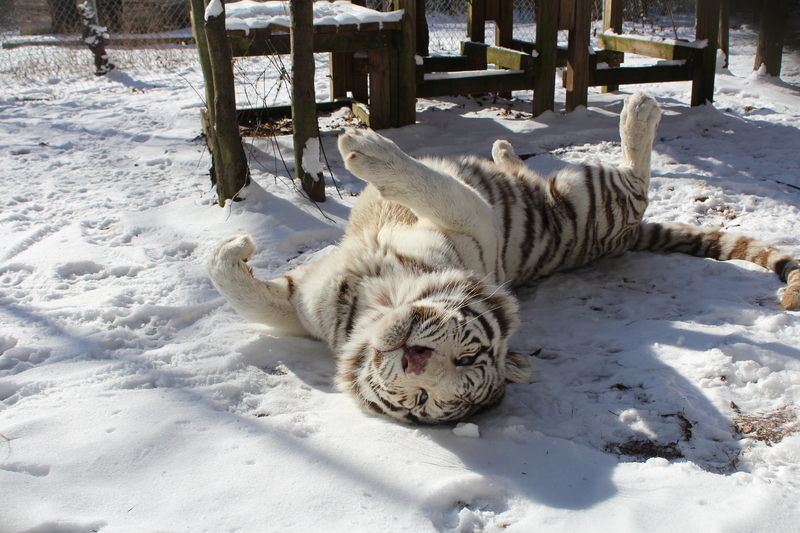 Saber is a very personable and silly tiger who does not seem to have a care in the world. He is very playful and loves to mess with Shenandoah. 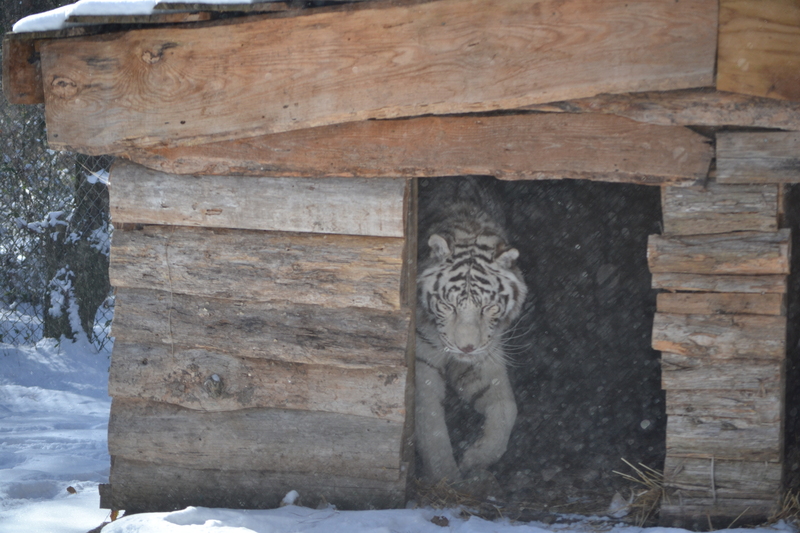 He is not always eager to come up and visit tours but he does not hide from them either. 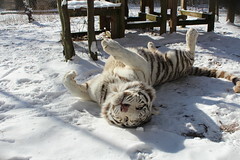 He likes to do things on his own time. 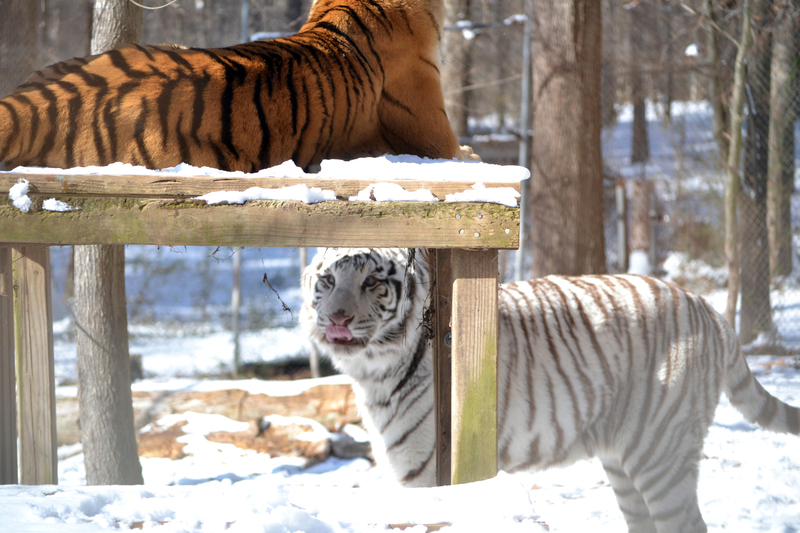 Saber certainly sticks out because he is white. 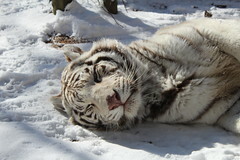 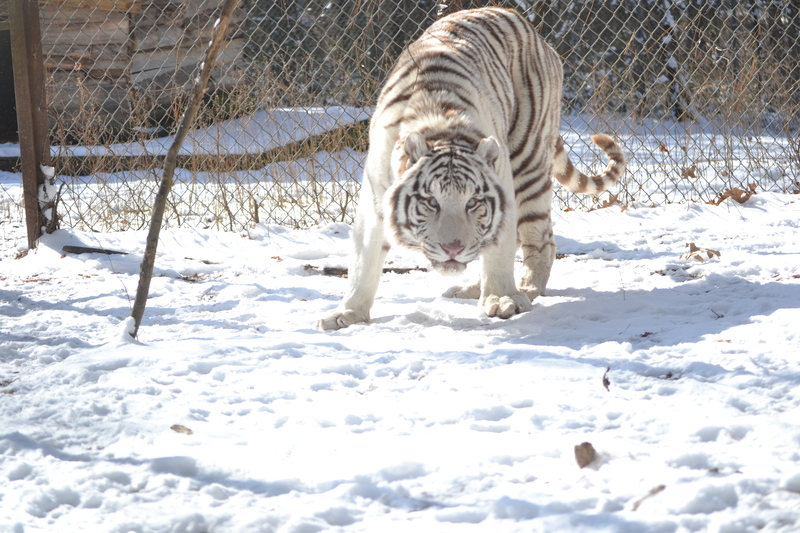 He has dark stripes and strikingly blue eyes, with which all white tigers are born. 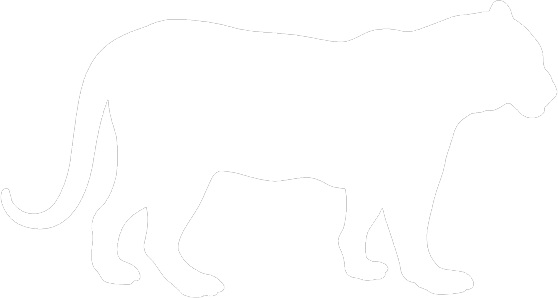 Although, his are noticeably crossed. When Saber yawns or opens his mouth, it is also obvious that his teeth were filed down to the gum line, which is a common practice in cub petting. 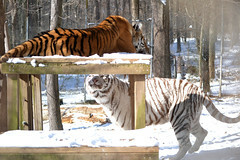 Saber lives on tour in Pine Forest with his enclosure-mate, Shenandoah, next to Mona and Moki Tigers, downhill from Petee Ocelot, and across the road from Madonna Tiger. 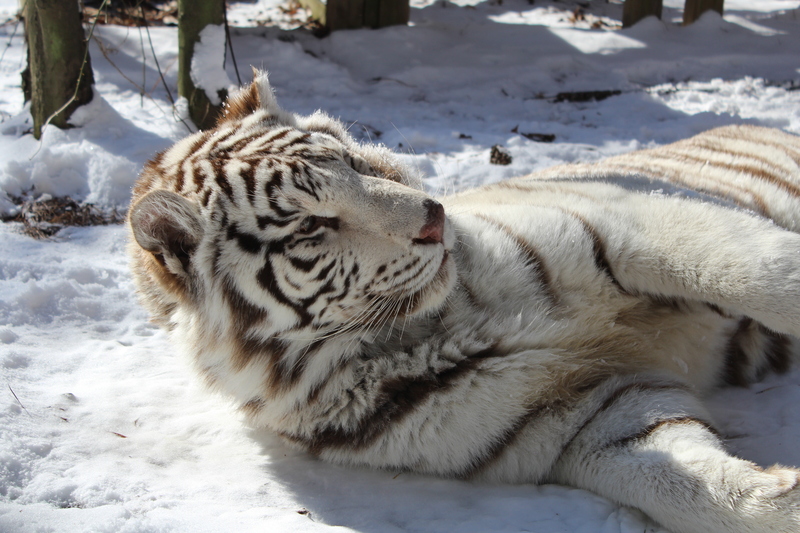 As beautiful as white tigers are, they are not a subspecies of tigers. 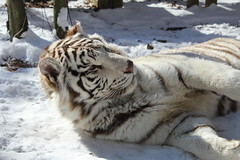 The white gene comes from a mutated recessive gene that both parents must have for the offspring to potentially be white. 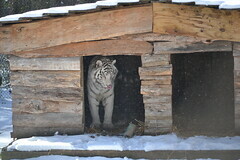 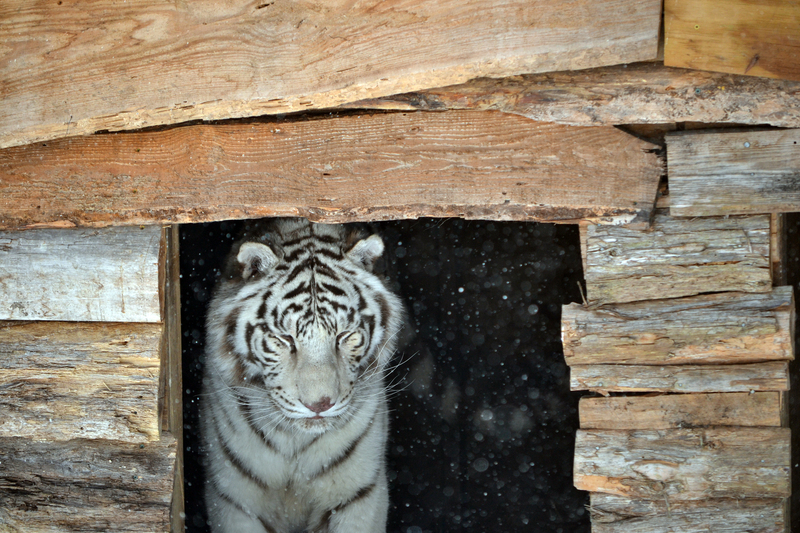 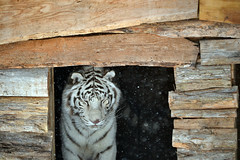 White tigers have a long history in captivity; they are all inbred and all relatives of one another. 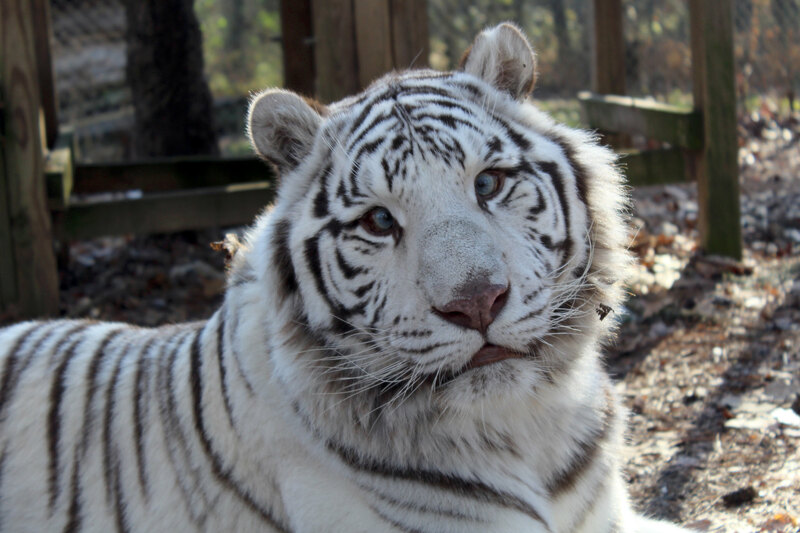 Due to the many years of inbreeding, white tigers are born cross-eyed with a plethora of other deformities, including possible deafness, scoliosis, and epilepsy. 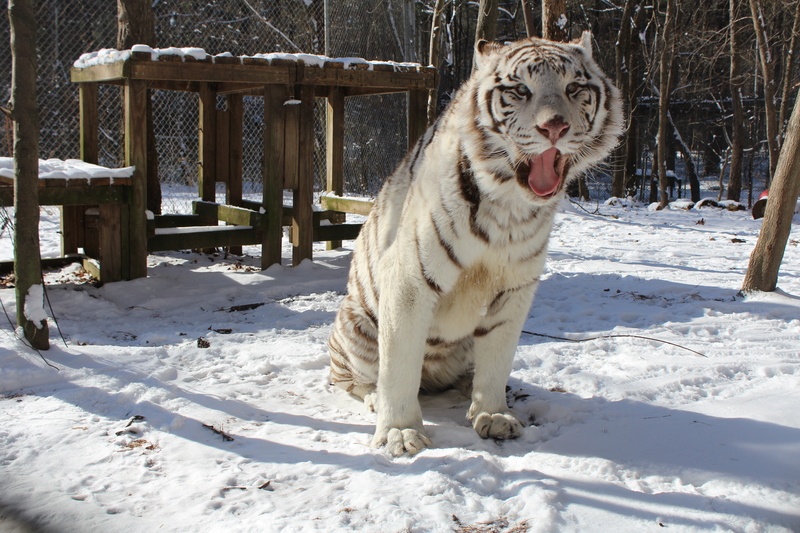 When a breeder breeds for a white tiger, whether for cub petting, entertainment, or a roadside attraction, only 1 in every 30 is "show-worthy". 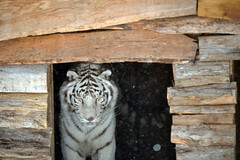 The question then becomes what happens to the other 29? 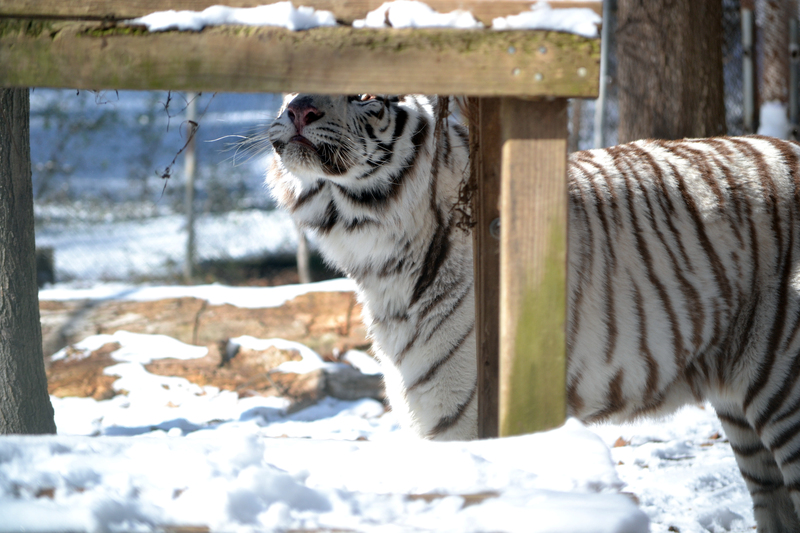 Carolina Tiger Rescue asks that you not support, directly or indirectly, facilities or entertainment venues that breed for white tigers.